Octogenarian judge’s observations on Sieger Shows, promising pups, missing teeth, and why the same dogs often win in both CKC and AKC dog shows. About 60 odd years ago I joined the German Shepherd Dog Club of Canada. They needed a person to run Shepherd Shorts (the club news) and I volunteered. My analyses of the Sieger Shows caught on all over America, written mostly from the show catalogs and knowledge of the dogs themselves. For a time I also wrote Breedlines for Dogs in Canada until they stopped production. I am now a member of the Sault Ste Marie dog club and no longer judge dog shows but we should encourage and promote the learning of what judging is all about. At one show there was a lady waiting to go in the ring with her Boxer. The dog looked so nice I asked if I could go over her dog. Oh! what a beauty, it should have won the group at least! I was taken with the movement when it had been shown earlier. This dog was new and didn’t win. I do not second guess the judges and it is hard to blame the judge for putting up what has won many times before however, I think that sometimes they make up their minds from what has happened at previous shows. A dog with a reputation of winning is easy to find. When I was at shows in Nova Scotia a Labrador went Best in Show under three out of four judges. There were good dogs there. Finally I couldn't resist and approached the last of the judges to put the dog up and asked him why that dog was placed Best in Show. I had thought from outside the ring that the dog was fat and moved around the ring with roll and reluctance. I knew the judge and he hesitated for a few seconds, then straight out said, "It has twenty three Best in Shows." There were only three German Shepherds at the Sault show plus a baby puppy and their owners all asked my opinion of their dogs. I was honored to respond. 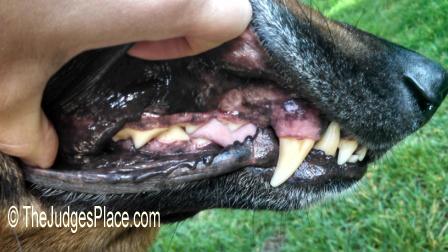 One had asked the judge if he did not consider her dog because it had missing teeth? The judge had replied, "No it was because she turned her back legs out as she went away." I had noticed the same thing but the dog had seemed to move well from the side. I put my hand in her mouth and felt the missing teeth. I wondered if the judge had even checked the side teeth. The owner asked me if she should continue showing her dog? I told her that the teeth would always be a problem, at least with specialty judges and that all-rounders would pick up on the going away movement. The dog did have a nice temperament and appeared otherwise sound; I suggested she have her dog's hips x rayed and if the hips were clean, breed her to a real good stud and keep a puppy to show. The other female shown in the breed had been very nervous and I thought missed being excused by a hair. Her handler and the owner of the only male worked on her to the extent of exchanging dogs and by the time the next show came up she was just fine. She allowed me and others to go over her without incident. I later saw a German Shepherd male, four days over six months of age. My hope is that he will continue to grow in the way he is developing, a big boned pup that shows some aggressiveness towards other dogs but just fine with people. This 6 month old pup is beautiful. He reaches out, drives behind, has a solid straight back, is true coming and going and is the kind of dog that the handler does not need to move feet around--he stands better on his own. He got the points on all six shows and on the last one was placed in the group. The owner said it was enough to finish his championship. I loved his character and know the owner will keep him under control. There is a similar story involving an Australian Cattle Dog. Two years ago at the Sudbury show this little pup in the 3 to 6 months class went into a tantrum wanting to get at a certain dog also in the ring. People looked at her with suspicion, some thought she would turn out to be a monster, uncontrollable, even though her quality was unquestionable. Well she came to the Soo show this year, a grown up model of quality that showed like a dream. I’m told she is now a Grand Champion and looks the part. 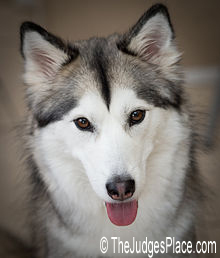 At another show a young Siberian Husky caught my eye. I was a bit annoyed when the judge did not take them around a few times together. These are working animals that pull and race, why can't we see them moving around the ring like they often do with German Shepherds? I was talking to the owner of this dog in the parking lot and he told me that it was an America Champion. The owner actually races this dog in a team as his lead dog. 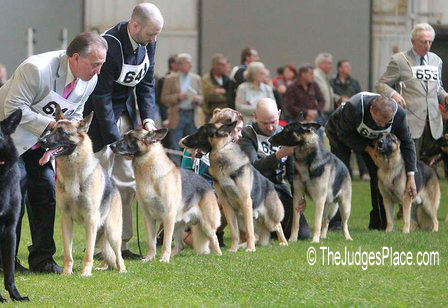 In my opinion his dog was hardly looked at but should have been considered and perhaps if the judge had moved the dogs as they do in the GSD ring, he wouldn’t have missed that outstanding Siberian. The point I’m making is that judges should recognize that no dog is perfect but as the person making decisions, it should be about each dog, its potential for the breed, and nothing else.